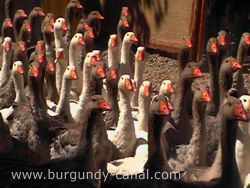 The medieval village of Chateauneuf has a very long history... 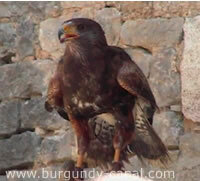 Situated on top of a hill overlooking the Auxois plains and the village of Vandenesse. 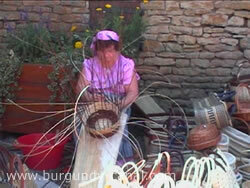 There is always something interesting in the village, from concerts to fairs to art expos. Near the main car park, there is a cross by a hollow oak tree, with a very impressive view of the Auxois plain and the water dividing line, the Burgundy canal from lock 12 to 8, you'll see at least three reservoirs and the Morvan hills far in the distance. The village is home to some excellent bars and restaurants, with terraces and fine tables. The castle was built in 1132 by Jean de Chaudenay for his second son Jehan. Jehan took possession of Castro Novo in 1175. The family reigned over the fief for 9 generations, en ending in tragedy in 1456, when Cathrine of Châteauneuf was burnt to death, after poisoning her second husband, Jacques d'Haussonville. The castle was then given by Philippe le Bon (Duke of Burgundy) to his godson Philippe Pot. The interior courtyard buildings were rebuilt and the castle made much more comfortable. As Philippe Pot had no children and died in 1493 the estate was given to his brother Guy Pot and through marriages Marie Liesse de Luxembourg. As she became a Carmelite nun, the castle and lands were purchased by Charles de Vienne, (Count of Commarin). For almost 150 years the castle remained in the family, until Louis Henri de Vienne sold to a rich banker "Paris de Montmartel" in 1767. Through various heritage the castle returned into the hands of the Veinne family. With the French revolution, the castle was taken away from the family, the lands divided. 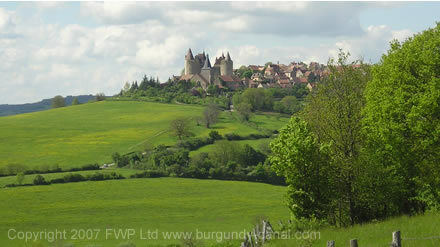 The new name of the village was Montfranc. All coats of arms and "Royal" symbols degraded or destroyed. The village remained important as garrison for the National Guard and a commercial centre with a population of more than 500. Jacques Blondeau is a famous Napoleonic general. The village begins to decline in population, as the cattle farming increases. 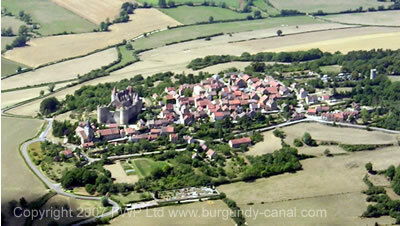 Along the Auxois plain below the Burgundy canal is constructed,the village of Châteauneuf fades away. The medieval market is held the last weekend of July every two years. 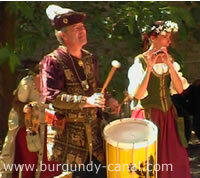 An impressive and an excellent festival for all the family, which is held every two years. The event takes months to organize and is acoomplished by volonteers. Minstrels, juggling, fire eaters, dancing, knights in armour and falconry. There is a josting match with horses and armed knights at the foot of the castle. Spit roast sheep, beers, wines, bread and cakes for the medieval banquet. Market stands with handicraft, jewellery, clothes and artwork.